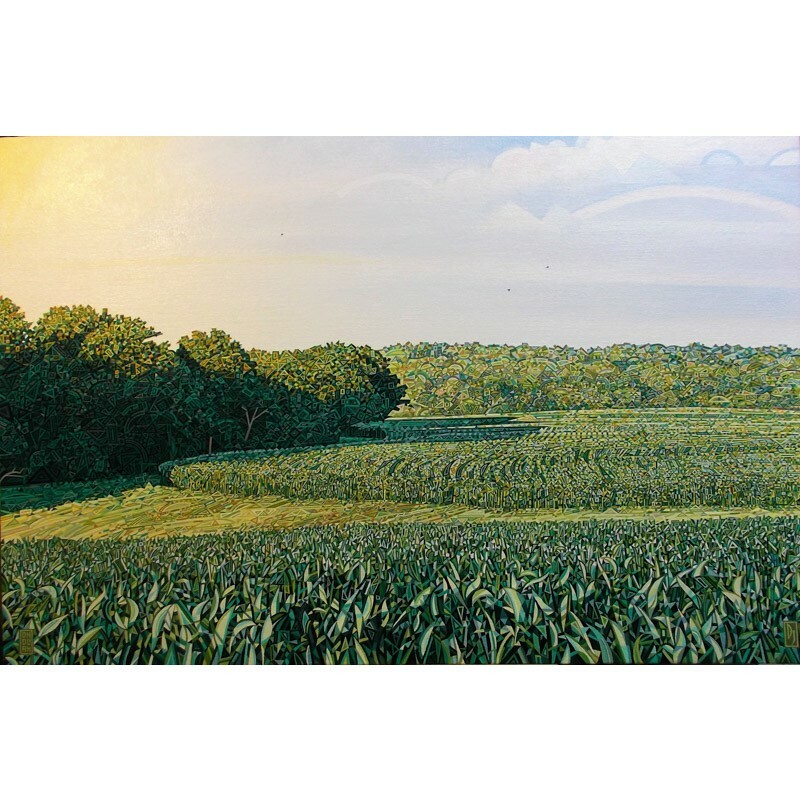 Doug Johnson is a self-taught landscape painter from Grand Island, Nebraska, with over thirty-two years of serious practice under his belt, and an impressive portfolio, which includes hundreds of finished paintings. 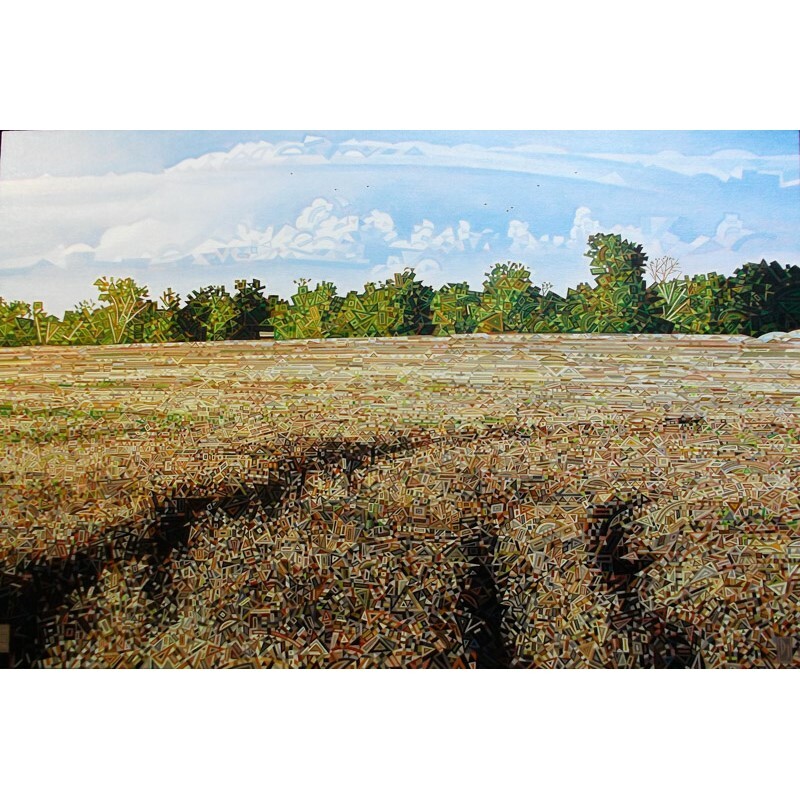 Through his meticulous work, Doug has “…no interest in making a social or political statement.” Rather, he concentrates his efforts to illustrate the beauty observed in the landscape near his Nebraska home - with awe-inspiring rivers, fields, and “big skies” - and throughout his travels to the Rocky Mountains, Black Hills, Badlands, hills of West Virginia and Southern California. The paintings reflect a close attention to the craftsmanship, design, and composition for which Doug is acclaimed. When viewed from a distance, they appear photo-realistic; however, upon close inspection, interesting details begin to emerge. There are complex areas of juxtaposed fragments, with sharp, clearly defined recurring shapes - arcs, horns, crescents, chevrons, and compressed or elongated polygons - which may translate as a kind of stylized pointillism. The overall effect can be astonishing and spiritual, as Doug Johnson’s work remains modern yet ancient, naïve yet meticulous, chaotic yet orderly. 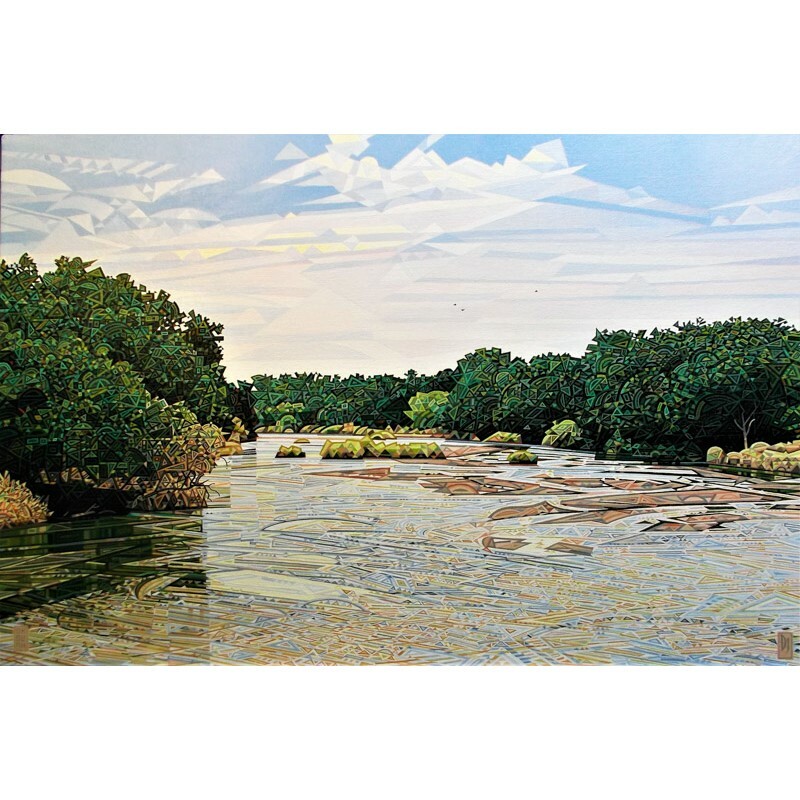 Doug Johnson is a self-taught landscape painter from Grand Island, Nebraska, with over thirty-two years of serious practice under his belt, and an impressive portfolio, which includes hundreds of finished paintings. Through his meticulous work, Doug has “…no interest in making a social or political statement.” Rather, he concentrates his efforts to illustrate the beauty observed in the landscape near his Nebraska home - with awe-inspiring rivers, fields, and “big skies” - and throughout his travels to the Rocky Mountains, Black Hills, Badlands, hills of West Virginia and Southern California. The paintings reflect a close attention to the craftsmanship, design, and composition for which Doug is acclaimed. When viewed from a distance, they appear photo-realistic; however, upon close inspection, interesting details begin to emerge. There are complex areas of juxtaposed fragments, with sharp, clearly defined recurring shapes - arcs, horns, crescents, chevrons, and compressed or elongated polygons - which may translate as a kind of stylized pointillism. The overall effect can be astonishing and spiritual, as Doug Johnson’s work remains modern yet ancient, naïve yet meticulous, chaotic yet orderly.